I am currently rebuilding my lab as it was time to refresh it. I run it all nested on VMware Workstation 15 as I have a powerful enough PC to run a nested three host cluster easily. Deploying the ESXi and VCSA OVAs is very easy in v15 so a single PC has more WAF than a bunch of server class machines. As part of the lab I run nested vSAN which obviously is not on the vSAN HCL so when the lab was built vSAN was showing a Health warning SCSI controller is VMware Certified which left an Alarm on the cluster which tweaked my OCD. As it’s a nested lab it would never pass this health check so I wanted to disable it. 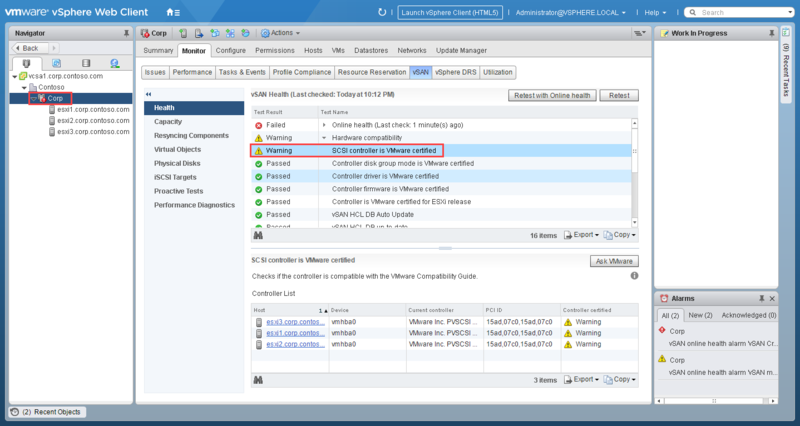 Using the Ruby vSphere Console (RVC) it is possible to disable any of the health checks. In this blog I will go through the procedure for cleaning up this warning in my cluster. This is all based on vSAN version 6.6.1. In my vCenter the Datacenter is called Contoso and the Cluster Corp. The RVC is a command line tool in the VCSA that is another CLI tool for managing vSphere. RVC is one of the main tools for managing and troubleshooting a vSAN environment. It’s a few years old but a useful starting point for the RVC. Joe along with Cormac Hogan also produced the VMware Ruby vSphere Console Command Reference for Virtual SAN. Again it’s a few years old but a useful resource. * List APIs: "help api list"
* List Plugins: "help pi list"
Install the "ffi" gem for better tab completion. We are now in the RVC. You can then browse down into things like the Cluster, vDSs, vSAN, etc. You can see the warning under the Hardware Compatibility section. 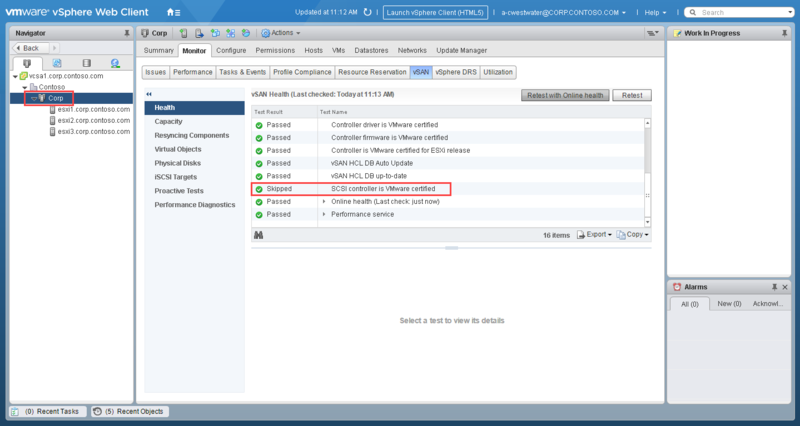 Each health check item has a particular ID associated with it which is then used with the vsan.health.silent_check_configure command to disable it. Now that check is skipped the warning is gone from my Cluster and my OCD is happy. The RVC seems to be a useful tool for checking and manipulating vSphere and vSAN so I am going to spend some more time investigating what can be done with it. I hope this post helps others that run a nested vSAN lab.